DanActive® is a delicious probiotic dairy drink that has been shown through clinical studies to help support the immune system*. It can be found in the yogurt aisle. 2)How DanActive® works and what are its benefits? 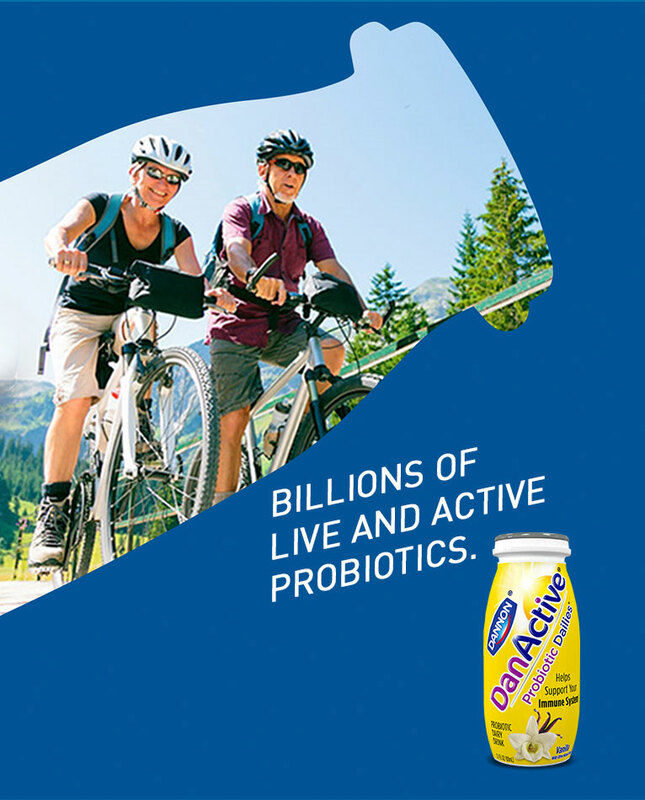 DanActive® is a delicious, probiotic dairy drink with billions of live and active probiotics that may help support your immune system*, and unlike probiotic supplements, it is a delicious food that provides essential nutrients like calcium. Each bottle contains more than 10 billion of its live and active probiotic, Lactobacillus casei Immunitas® (L. casei DN-114 001). This probiotic survives and remains active in the digestive tract where about 70% of your immune system is located. 3)How many probiotics are in DanActive®? Each bottle of DanActive® contains 10 billion of its live and active probiotic. 4)How should it be consumed? Enjoy DanActive® regularly as part of a balanced diet. Drinking DanActive® each morning is a smart and simple addition to your healthy routine. DanActive® is great for the whole family. DanActive® is suitable for children as soon as their diet has become varied, i.e. from the age of about 3 years old, mainly for nutritional considerations. 6)Is DanActive® gluten-free and kosher? DanActive® is Certified Gluten-Free, Kosher K, contains live and active cultures, and is a good source of calcium per serving. 7)What are some other benefits of probiotics?